Destination: London. A Travelers Journey. Let me tell you how I spent a Canadian Thanksgiving in London last year – and how unusually this trip was assembled together. Back in April, I found out – by sheer accident – that Jean Michel Jarre (a French electronic music composer and performer) was planning a world tour. This was a first for him, as he’s typically known for putting together amazing mass spectacles in huge open spaces – sometimes in familiar world attractions. The Forbidden City in China, the Pyramids in Egypt, Merzouga in Morocco, Gdansk Shipyard in Poland, Eiffel Tower in Paris – the man knows how to put together a grand-scale musical event, one that is surely to go into record books. Big crowds, once-in-a-lifetime event, near-impossible to get tickets. But this tour was different. Jarre was planning to do smaller venues – concert halls and the occasional small stadium – and visit dozens of cities. And his tour included many European cities. So I got out my credit card and started searching the web for tickets. Little did I know that this single concert would evolve into an amazing week-long visit. The choice of London was a no brainer. It’s a quick flight from Toronto, Jarre’s show was in mid-October, which meant cheaper fares, and easy-to-find accommodations. And it was also a Sunday night, 10.10.10 – the long-weekend of Canadian Thanksgiving. We have a day off on Monday, it was a sign from above to get those tickets, and strangely enough, we managed to get good seats, at a good price! It was no surprise to later find out that this concert at O2 Arena was eventually sold out (up to 23k capacity). Small venue indeed! But our seats were safe. Now came the fun part – planning the rest of the week in London. After all, we’re not just going to fly in for one or two evenings. I usually plan my travels via websites (what’s a travel agency these days?) but this time I wanted to experiment with mobile apps. Sure, I’ve done my share of flight lookups and hotel reservations. The occasional ‘events-‘ based application for a major city is always useful – but typically, it would be for the duration of your trip, without lasting value. So I tried multiple apps. I found out earlier in the year that StreetMuseum app allowed you to see London’s past, overlaying actual archival photos over today’s landscapes. Sort of like augmented reality combined with time-travel into the past. I also was concerned about London’s extensive transit system (underground, rail), and loaded up JourneyPro and Metro apps – for a quick look-up of which station is nearby. They both came in very handy – I only had to ask for directions twice during the entire week. And, of course, I loaded up mTrip London app – with its ‘itinerary builder’ – which does exactly what it says. It will give you a walking/sight-seeing itinerary for your trip, based on your duration of stay, location of accommodations, and even your interests. Of course, building daily itineraries was the toughest part of trip-planning – so much to see, and only a week to do it. So it was decided to concentrate on a few popular areas of the city, and wing it, based on the recommendations from the apps. Turns out, this was the simplest, and most rewarding approach to the city-crawl. For example, one day my wife and I were planning to see Tate Modern, Shakespeare’s Globe, Tower Bridge and The Tower of London. Not a busy itinerary, our estimates showed this can be comfortably done in 4-6 hours, with plenty of time for breaks and eats. But as we got off Waterloo station (wanted to walk up to Tate from West, as the sun was rising), the city just started opening up to us: the Waterloo Bridge and National Theatre (which can be so monolithic and peaceful in early morning); Gabriel’s Wharf (almost the exact opposite, at any time of day); Southwark Cathedral – which you cannot find easily, as it’s pretty much surrounded by taller, newer buildings. We passed by the Madhatter Hotel, and took some pics of its quirky facade. It only has 30 rooms, but man, do I want to stay in there one day. 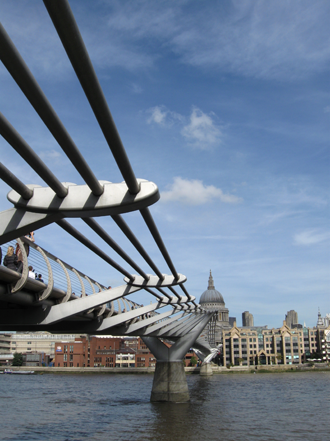 The Millenium Bridge was just between Tate and Globe, so obviously, we strolled back and forth. And just before we arrived at Tower Bridge, we discovered a small (but effective) fright-fest called “The London Bridge Experience”. It’s actually located under the bridge, with all the original tombs and passages, so it’s more authentic than many other similar attractions around the city. Surprisingly, a lot of locals go to these places as well. 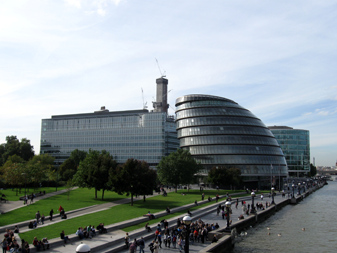 After we had lunch at Potter’s Field park, next to the City Hall (a strange, grasshopper-looking building), we finally crossed the Tower Bridge and spent the rest of the afternoon crawling around in the Tower. So this was day one – a simple walk along the South Bank that turned into a full day of discoveries, and didn’t require us to hop on more trains, catch taxis or run to the next destinations. The apps told us about the little things on the way to big tourist magnets. We knew the working hours of every place, and train schedules for every station in the vicinity, it was just a matter of finding time to stray off the course before the next big stop. Every day turned out to be a series of discoveries. The minute we’d come up from the metro (we stayed out of town and took trains into the city daily), we’d be a block away from to something worth seeing. 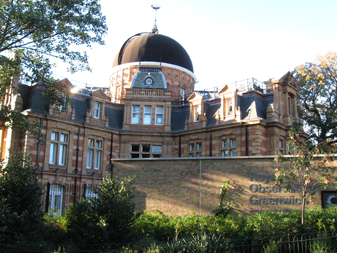 Even on the day of the concert, instead of going directly to O2 Arena, we took a leisurely river tour to Greenwich, spent some time at the observatory, and the local market, stopped by Canary Wharf, and only then went to the Arena. I still can’t believe that a venue that large has enough eateries to accommodate any taste, and any group of people. Thai, Italian, a Tex-Mex steakhouse, Japanese teppanyaki – you can always find a table, and the crowds just dissipate in the vast hallways. Even the British Music Experience didn’t feel crowded, and the arena was full of music fans that night. By the way, if you’re ever at the BME, keep your interactive tickets, you can do so much more with them online after you get back home. Jarre didn’t disappoint that night – the famous green laser harp, the introspective video clips, and constantly re-inventing, rediscovering the mechanics of sound. As we were going home that night (the underground system ran both eastbound and westbound trains away from the Arena to dissipate the crowds faster – neat, effective practice) we realized that after a busy week in this city, we only scratched the surface, and would love to go back, even to the same sites and places we’ve already seen. And that’s not even mentioning the rest of London that we haven’t even seen yet. 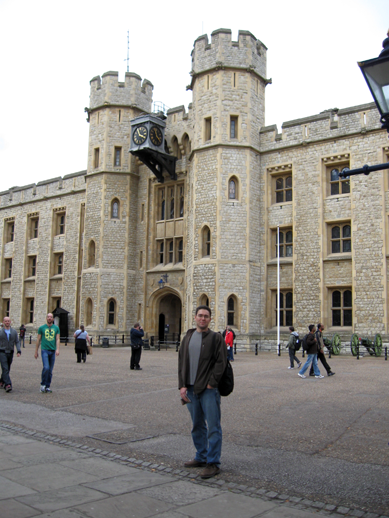 So, in the end, my first (and rather brief) visit to London was localized, organized and very intimate. With the hundreds of things to see and take in, I was able to filter out the tourist traps, map my daily route, and stick to it, with all necessary adjustments for traffic, weather and business hours. All that – from a couple of really useful, intuitive apps. No stress, never feeling lost, and always on time. The various Tourism kiosks around the city also helped tremendously. With coupon books, show reservations, and early on, they talked us into getting a transit card. Best decision ever – paid for itself, no lineups at the metro entrances, no missed appointments. Definitely grab a transit card when you’re in London. Everything – and I do mean everything – becomes just a few stops away. This massive, ever-expanding city shrinks to the size that you can envision, the scope that you can reach, and it never overwhelms. I’m looking forward to more trips to London, and I’m relying on a few proven apps that cam in handy during the planning and the visit itself. 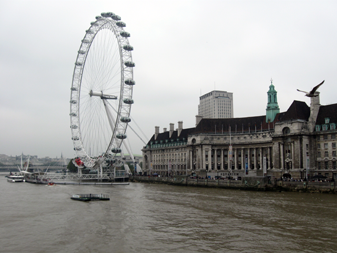 In case you’re wondering, no, we haven’t been to the London Eye, but have passed it probably a dozen times. Sorry, but it’s just not worth it. However, the tiny Persian restaurant around the block – that’s an exotic, memorable meal, to finish off a hectic day. Look for it on Belvedere Rd. and Chicheley St. And find my Foursquare check-in from October 2010. D.B. is a web producer / project manager based in Toronto, Canada. He has been involved with multiple Canadian magazine brands (Outdoor Canada, Canadian Gardening, Canadian Living, The Hockey News, Elle Canada, Homemakers, to name a few), and helped them migrate from print to web, grow online, and move beyond to other platforms. He’s active in many of Canada’s online publishing associations, with an eye for future, and for magazines’ possibilities beyond print. In his spare time Dmitry travels to other corners of the world, and gardens profusely in his yard on the weekends.